With all the news of crossovers taking over the market and torpedoing the sales of just about everything else, the Honda Civic stands out as a glimmer of hope for the traditional car. 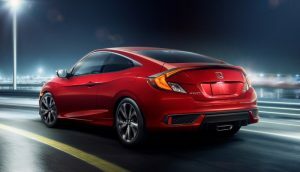 Available as a practical hatchback, sporty coupe, as well as a popular sedan, the Civic family has become a top-seller in Canada and a segment leader in the marketplace. The latest generation is the largest, most accomplished version to date, and, for 2019, has been given a number of thoughtful updates as part of a mid-cycle refresh. To sample the latest updates, we tested two variants: a sedan in the top of the range Touring trim and a two-door coupe in the new mid-range Sport trim. Though the hatchback model makes a convincing case in terms of cargo space and practicality, the sedan’s more approachable appearance help keep it at the top in terms of popularity. To help differentiate the trim levels, entry-level models receive chrome accents and 16 inch wheels, whereas the Sport models receive blacked-out trim, dark-coloured 18 inch wheels, a rear decklid spoiler, and a centre-mounted exhaust. The coupe model is the sportiest-looking of the bunch with cool details such as an LED taillight strip that runs across the rear deck. 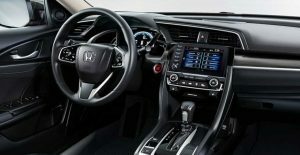 On the inside, the Civic impresses with mostly upscale materials and excellent fit and finish comparable to that of the premium-positioned Acura models. Storage spaces are plentiful and the sedan version is spacious enough for four adults to sit comfortably. The infotainment system has been revised to include a row of shortcut buttons alongside the touchscreen as well as a real volume knob. Unfortunately, the interface itself has not been updated to the latest version found on a few other Honda models, but at least it is compatible with Apple Carplay and Android Auto. Honda has also revised the straightforward climate controls to include buttons for fan speed. Now if they could only do the same for the air conditioning and air flow direction, while eliminating the odd climate button, then the ergonomic updates would be complete. 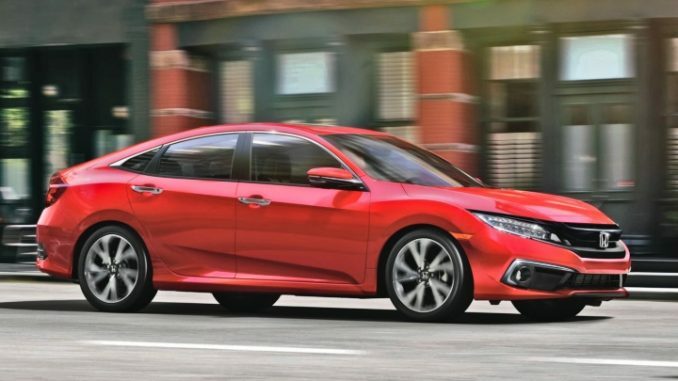 As far as the driving experience is concerned, the Civic strikes an excellent balance between daily-driver comfort and athletic driving dynamics. The suspension is far more absorbent than that of previous models and does a fine job of smoothing out any significant rough patches in the road. Thanks to its light, responsive steering and well-damped suspension, the Civic feels eager to tuck into corners with impressive body control. Those looking for a bit more performance may want to consider the sporty Si model; however, even the lower trims offer a decent amount of driving fun. Most models come equipped with a naturally-aspirated 2.0L 4-cylinder engine producing 158 horsepower and 138 lb-ft of torque matched to a smooth-operating continuously variable transmission (CVT). A 6-speed manual gearbox comes standard on select trim levels as well. The Touring model swaps the 2.0L out for a turbocharged 1.5L unit with 174 horsepower and 162 lb-ft of torque. As nice as it is, the extra power and complication of the turbo engine is far from necessary. The entry-level engine produces an adequate amount power along with a refined delivery and appealing engine note when pushed. Fuel economy is about the same either way with an average of 9.0L/100km in the city and 6.5L/100km easily doable on the highway. Pricing ranges from $17,790 to $28,990 for the sedan and from $21,190 to $29,390 for the coupe. All models now come equipped with Honda Sensing active safety technology with includes forward collision mitigation with collision warning, lane departure warning, road departure mitigation, lane keep assist, and adaptive cruise control with low speed follow. Although the CVT-equipped LX sedan will likely prove to be the most popular variant at $21,990, the $25,490 Sport model would be my choice for its additional features and sporty garnishes. Unfortunately for Canadians, and unlike many rivals, a heated steering wheel is not available on any trim level. Although the compact car segment is filled with excellent options including the Toyota Corolla, Mazda 3, Hyundai Elantra, and Kia Forte, the Civic continues to stand out for its carefully crafted blend of fine driving characteristics, well-executed interior, and abundance of choices in terms of trims and body styles. It may come at a small price premium and lack incentives when compared to some rivals, but it’s a premium that will likely be paid back with a strong reputation for reliability, low running costs, and top-notch resale value. In any case, those willing to take the plunge will be rewarded with a well-rounded, highly accomplished vehicle that’s well deserving of its best-seller accolade.